Mike Ullery/Daily Call Covington’s Brandon Magee runs the anchor leg of the 400 relay Saturday. Mike Ullery | Daily Call Ben Miller of Covington runs the 300 meter hurdles event. Mike Ullery | Daily Call Devon Jester of Houston runs the 3200 meter race on Saturday in Columbus. 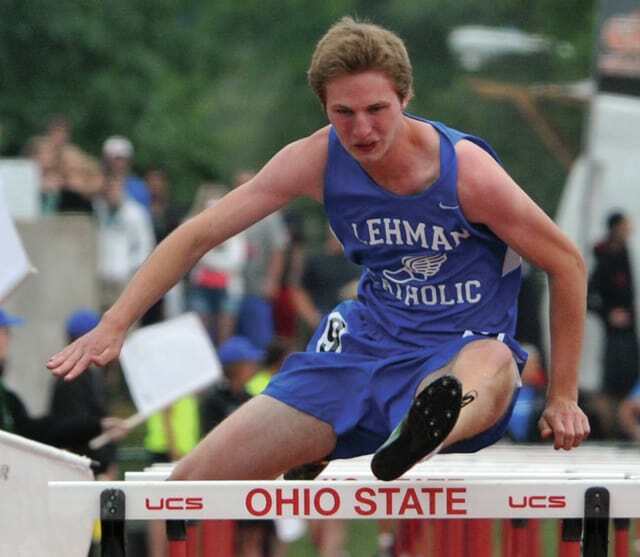 Mike Ullery | Daily Call Teddy Jackson of Lehman Catholic runs the 110 meter hurdle finals on Saturday. COLUMBUS — Versailles senior Richie Ware had a goal in the Division III boys state track and field 800-meter run at Jesse Owens Stadium. And in the end, Ware accomplished that — finishing his career on the podium with a sixth-place finish after a time of 1:57.77. In the end, he achieved his goal. The Covington boys 400 relay team of Ethan Herron, Ben Miller, Shane Straw and Brandon Magee finished the season on the podium, finishing seventh in 44.68. At the same time, they accomplished something Covington hadn’t in the previous two years. Last year, A.J. Ouellette and Dalton Bordelon ran on the relay team before graduating. Neither Straw or Herron expected to finish their season on the podium. Magee felt that way as well. Straw said there success was simple. Miller’s bad luck from the regionals continued in the 300 hurdles. He had originally finished ninth in 40.07, but was disqualified. Lehman senior Teddy Jackson just missed the podium, finishing ninth in the 110 hurdles in 15.42. Houston’s Devon Jester finished an outstanding prep career by finishing 10th in the 3,200 in 9:38.18, just missing the podium.